I am a System Admin. In addition to our company's sandbox, I also created a new Developer Org to see if it is any different. 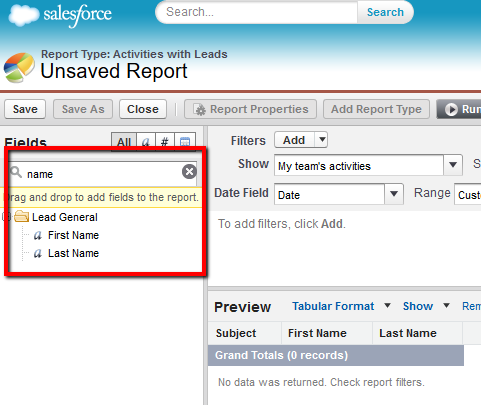 However, I can't seem to find Lead Name (the FULL NAME) field to use as a column or group by in my report with Leads or Activities with Leads standard report types. 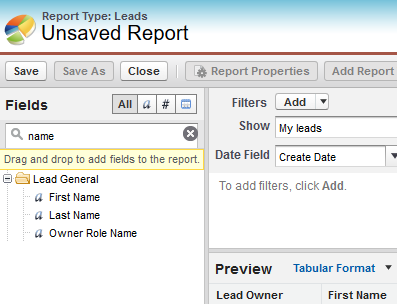 Also, Owner Role Name shows in Leads report type but not in Activities with Leads. Why so? I tried Accounts and Activities with Accounts and Account Name shows up just fine. Also, Account Owner Role field shows in Activities with Accounts report type. Why the difference? Is there a setting I could be missing? Hate to create custom report types for something that I feel should work straight out-of-the-box. Browse other questions tagged reporting leads custom-report-type or ask your own question.